Frank Sorick, president of the association and an Independent Gazette reporter, told the Gazette that this is the second request the association has made to the city seeking an explanation of why the city was required by the state to pay $5,316.92 in fines, and that with each request the city has responded with a copy of the check and a spreadsheet bearing the words “PA Dept of Revenue” hand-written at the bottom. “Who knows where that spreadsheet came from? Even if it were from the PA Dept. of Revenue, where is the cover letter detailing the what and why the fine was levied?” Sorick said. Various newspapers have reported on the 2009 Department of Revenue resulting from the improper use of city gas by being dispensed into non-municipal vehicles. Currently, the city is under federal investigation stemming from a Times Leader investigation into additional missing gasoline, as roughly 67,000 gallons of fuel dispensed between July 1, 2010, and June 30, 2012, could not be properly accounted for, as reported by the Times Leader on July 1, 2012. The court date for the Taxpayers v. City case is currently June 9, time 9:30 a.m., courtroom #3 in the Luzerne County Courthouse. 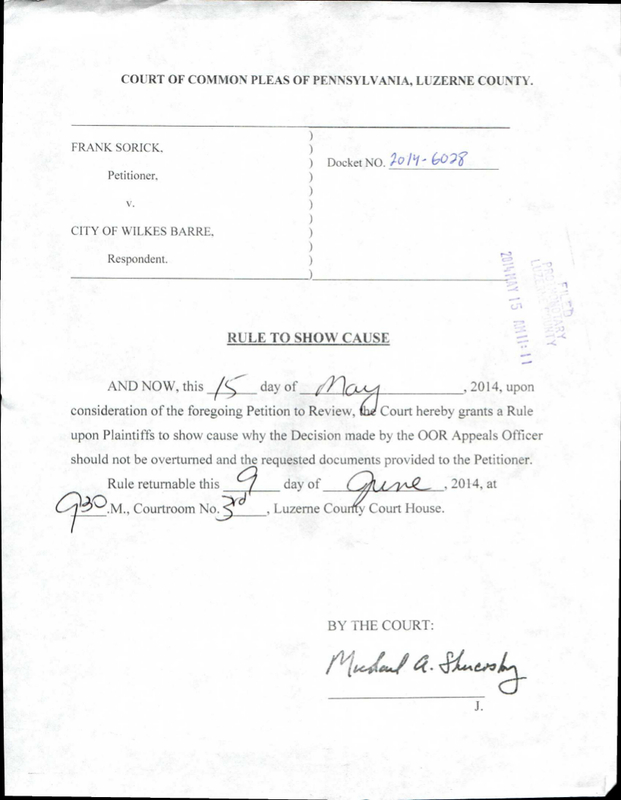 The full Petition for Review may be viewed by clicking on the cover page thumbnail to the right.